In the grand geological-recycling scheme, sediment is (A) the product of weathering and erosion of rock and (B) the material for future rocks. Sediment grains range in size from tiny clay particles to large pieces of gravel, and even boulders. This article describes a simple experiment using a settling container to determine the relative amounts of sand, silt, and clay in sediment. The maximum size of sediment and the relative amounts of sand, silt, and clay in sediment are clues that help geologists decipher the geologic history of the sediment and resulting sedimentary rock. The size of grains in sediment correlates directly with the amount of energy necessary to move and deposit it. High-energy processes, such as the ocean surf, glaciers, rivers, and landslides move very large fragments. Medium- and low-energy wind and quiet-water processes transport smaller sizes. Gravel, sand, silt, and clay are terms of grain size; the composition of the grains is immaterial to the definitions. Gravel-size grains have a diameter, or side, longer than 2 millimeters (0.08 in), about the thickness of two dimes in a stack. Sand grain diameters are between 0.0625 and 2 millimeters (0.0025 and 0.08 in), silt grains are between 0.004 and 0.0625 millimeters (0.00016 and 0.0025 in), and clay grains are smaller than 0.004 millimeters (0.00016 in). Sand and gravel grains are visible with the unaided eye, whereas a magnifying glass is needed to distinguish individual silt grains. Silt grains are gritty between your teeth; clay grains are not gritty. Most clay grains are “sticky.” Sediment that has a high percent of clay particles can be rolled between your hands into a “worm” when mixed with a little spit or water. Wire screens (or sieves) are used to determine the relative amount of gravel- and sand-sized grains in sediment. An approximation of the relative amount of sand-, silt-, and claysize grains in sediment can be obtained using a settling container. The materials needed are: (1) a 2-liter plastic soda bottle, (2) a ruler that is at least 10 centimeters (4 inches) long, (3) a measuring cup, (4) a clock with a second hand, and (5) a teaspoon of dishwasher detergent. 1. Collect about a cup (225 grams, 8 ounces) of air-dried sediment. 2. Crush the dirt clods, and pick out any gravel, animals, and plants. 3. 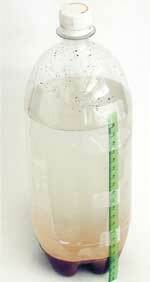 Put the sediment into the soda bottle, add one teaspoon of detergent, and almost fill the bottle with water. 4. Shake vigorously to mix and suspend the sediments. The detergent breaks up sticky clay particles. 5. Gently place the bottle on a flat surface where it won’t be disturbed for several hours and begin timing the sediment fall. 6. After 45 seconds, place the ruler against the outside of the bottle and measure the height of the SAND deposit from the bottom of the bottle. This value is A. 8. The height of the SAND + SILT + CLAY column is measured when the remaining water looks like dilute tea or tainted water, after about 4 hours to several days. This value is C.
9. The percentage of SAND in the bottle is (A/C) x 100, the percentage of SILT in the bottle is ((B – A)/C) x 100, and the percentage of CLAY in the bottle is 100% minus the sum of SAND% and CLAY%. 10. You now have percentages of SAND, SILT, and CLAY in the sediment.